Administrators, faculty, staff and other members of the Indiana University family have been hard at work for the past three years implementing the university's Bicentennial Strategic Plan, which will lead IU into its third century. Members of the IU Board of Trustees heard a midpoint update on the strategic plan at their Friday meeting on the IU Southeast campus. Details were shared by John Applegate, executive vice president of university academic affairs, and professor Michael Rushton, associate vice president for university academic affairs and director of strategic planning. "It is appropriate now, at the midpoint in the plan's timeline, to take stock of our progress on the specific action items in the plan," IU President Michael A. McRobbie said. 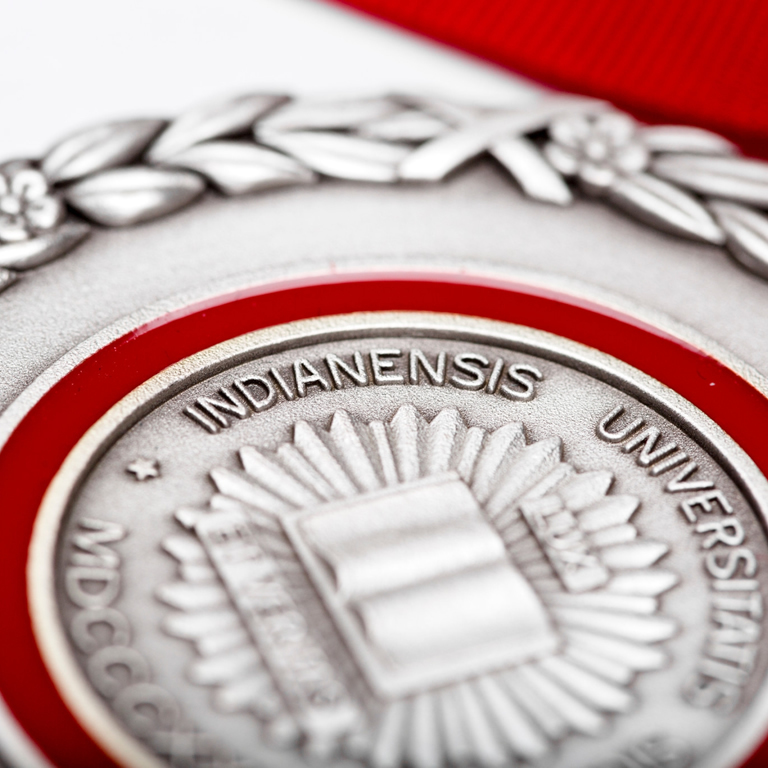 "Even at this point in the plan's execution, much has been accomplished, including our nationally recognized debt reduction programs, improving program rankings, the launch of the Grand Challenges program, the introduction of engineering and architecture degrees on the Bloomington campus, the opening of new Indiana University gateways around the globe, and the use of innovative teaching methods and online education across all of IU's campuses to bring expanded opportunities, and success, to our students." The complete update report will be available at strategicplan.iu.edu. "Every campus and every major school and administrative department is represented in this report," Applegate said. "That speaks to the university's comprehensive response to the calls for action put forth in the Bicentennial Strategic Plan." The university's MoneySmarts program, an initiative designed to help students understand the impact of student loan borrowing and repayment schedules, has been recognized as a Model of Excellence by University Business Magazine. In addition, borrowing by all IU students dropped nearly $100 million from fiscal year 2012 to fiscal year 2016, and borrowing by Indiana resident undergraduate students dropped by $63.7 million during that same time period. As of fall 2017, IU had a record 5,066 students enrolled in 116 online degrees and more than 2,000 online courses, representing a 4 percent increase over 2016. Nearly a third of the total student body are enrolled in at least one online course. The Office of Online Education, in collaboration with the Office of Collaborative Academic Programs and eLearning Design and Services, began hosting an annual statewide IU Online Education Conference in 2016. Presentations address empirical research, showcase best practices and/or describe lessons learned related to several areas, including showcasing digital innovation and promoting student success in online courses or programs. More than 400 participants are expected at the 2017 conference. The Regional Faculty Caucus, in collaboration with the Office of Regional Campus Affairs, has been working to identify communities of practice across the regional campuses. The IU Faculty Colloquium for Student Success, a virtual community, was launched in August 2016. The university has funded three Grand Challenges: the Precision Health Initiative, Prepared for Environmental Change and Responding to the Addictions Crisis. Cluster hires and work have begun to support each initiative. IU Bloomington has also announced a major new program called Emerging Areas of Research, while IUPUI launched the Enhanced Mentoring Program with Opportunities for Ways to Excel in Research, or EMPOWER, designed to support faculty who are from historically underrepresented and/or excluded populations in their discipline or area of scholarship. The New Frontiers in the Arts and Humanities has awarded more than 150 grants to faculty members on every IU campus since 2015. Network updates include new Data Center top-of-rack hardware; a 100 GB upgrade to the IU Bloomington and IUPUI campuses including Internet2 network; and all IU regional campus connections were upgraded to 10 GB. Provide Indiana P-12 schools with support for the highest quality teacher preparation and continuing education, outstanding education attainment by Hoosier students and greater equality in the access of all students to an excellent primary and secondary education. Increase enrollment in teacher preparation programs, with an emphasis on addressing teacher shortages in Indiana. Coordinate with the universitywide Education Council and Education Deans Council. IU has universitywide, multilevel partnerships with 54 universities around the world, and 87 sub-agreements for exchange programs and other collaborative activities. IU Bloomington ranks 11th nationally in terms of the number of international students seeking an undergraduate degree, and there were 8,990 international students on all IU campuses in 2016-17. In addition, nearly 4,000 IU students studied abroad in 2015-16. The university hosted 134 international alumni events in 2015-17, and IU has 47 international alumni chapters in 43 countries. IU has three gateway offices in Beijing, New Delhi and Berlin, with gateways in Mexico City and Bangkok to open soon. Across all U.S. medical schools, the IU School of Medicine has risen in the National Institutes of Health rankings from 41st in 2013 to 36th in 2016 to a tentative 33rd in 2017. The IU School of Medicine is expected to receive more than $500 million in National Institutes of Health and National Science Foundation funding in fiscal year 2017. Major strategic facility investments are scheduled, including a Riley Hospital for Children Maternity and Newborn Health Tower, the IU Health Bloomington medical campus, a new cancer center at IU Health North Hospital, and addition of in-patient beds at IU Health West Hospital. IU has been recognized among the most innovative universities in the world by Reuters Top 100: 27th worldwide, 19th among U.S. universities and first in Indiana. More than $142 million has been generated and distributed per intellectual property policy, with more than 3,000 invention disclosures and more than 4,600 global patent applications filed since 1997. The Indiana Philanthropic Venture Fund was initiated in October 2017, with $10 million available for supporting innovations within the IU ecosystem. The university launched new bachelor's, master's and Ph.D. degrees in intelligent systems engineering. There are already 58 undergraduates in the bachelor's program and 43 doctoral students. The first cohort of master's students will enroll in fall 2018. The school's name was changed from the School of Informatics and Computing to the School of Informatics, Computing and Engineering. The university launched a new master's degree in architecture, a first for IU. In addition, the school's name was changed from the School of Art and Design to the School of Art, Architecture + Design. McRobbie announced the Bicentennial Strategic Plan during his 2014 State of the University address. The plan, dashboard and related strategic plans are available at strategicplan.iu.edu. The full text of Friday's update will be shared on the site.